One of our original founding fathers, Gord’s name appears on our April 10, 1947 I.B.M. Charter as a Charter member. As Past President, Gord has some very interesting and historical magic and has lead a very unusual life. Travelling around the world in his youth performing magic to live, Gord visited many different countries and had many adventures. 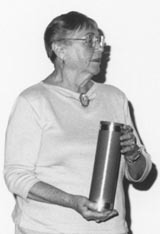 Joan Caesar has been a faithful member of Ring 49 for many years. Past International President of I.B.M. – T.V.P. 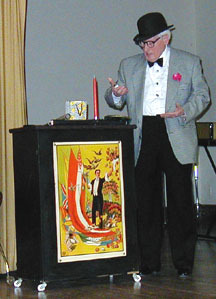 for Ontario, Joan Caesar has also been instrumental in the development and success of CAM, the Canadian Association of Magicians. 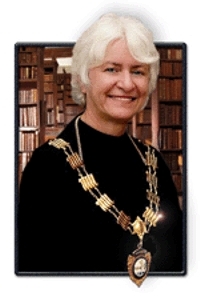 She has served as President of Ring 49 and has helped with all aspects of the club. Joan performs her children’s magic act at libraries, schools and birthday parties. Joan was made an Honorary Member of Ring 49 in 2010. One of our earliest members, Cam Hooton, Past President was a driving force in the success of I.B.M. Ring 49. 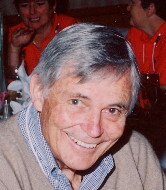 He passed away in January 2012. For many years Cam maintained files of photos and information about the club. Cam spent time doing shows for the elderly and was always great with charity shows. His skills were Auctioneer were invaluable in the club’s past. Cam was a member of the Order of Merlin Excelsior and was a member of I.B.M. for over 60 years. ‘ Madame X’ as she is known, has been a long time Ring 49 member. Sophia is quick to vanish a coin and performs children’s magic on a regular basis. She was named an honorary member of the club in 2011. 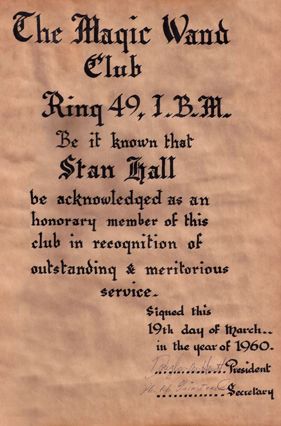 One of our original founding fathers, Stan’s name appears on our April 10, 1947 I.B.M. Charter as a Charter member. . 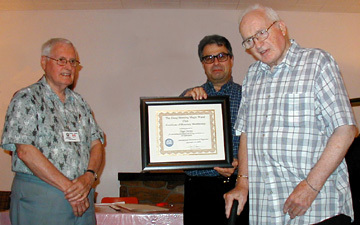 Presented with Honorary Membership September 14, 2004, by club President Nick J. Sacco, with help from long time member and Past President Cam Hooton, for outstanding contribution to the club and local magicians across Southern Ontario. A legend in Southern Ontario magic, Hugo Furney has helped countless magicians with their magic including Doug Henning. Hugo is an experienced performer, having entertained in the Niagara area for over 45 years. He played Merlin, at Henry VIII Banquets at the Buttery Restaurant in Niagara-on-the-Lake, Ontario and was the first resident magician at the Houdini Magical Hall Of Fame in Niagara Falls, Ontario. Hugo is a member of I.B.M. Ring 12 Buffalo, Ring 49 Hamilton and Ring 294 Fonthill. He is Order of Merlin, member of the Junior Chamber of Commerce, Past President Thorold Jaycees and Lifetime member JCI Senator. Hugo was Publisher/Editor of the Thorold News, one of the first newspapers to be produced on computers using Desktop Publishing (Pagemaker). Computer wise, he is a member of the AMUG club and puts out their newsletter. hugo has six children and 12 grandchildren, likes fishing, has a bass boat but can’t seem to find the time to use it as often as he’d like. He volunteers at the MacKenzie Print Museum in Queenston, Ontario, helping out once in a while to give regular staff a day off. He has worked in the printing industry for over 40 years, starting after school, then attending Western University, Graduating in Journalism in 1952. Hugo has seen many changes in the printing industry and has set type by hand, linotype and then computer. Hugo’s Certificate, Gold Pen and Magic Wand in case.